"Here's Sonic the Hedgehog, rolling at high speed through a cartoon world just like real-life hedgehogs don't." Sometimes, whether due to a specific visual style or use of anthropomorphism, a character who belongs to a clearly-identified Real Life species ends up looking nothing like what that species actually does. Some examples are understandable and forgivable, especially if they are also an example of Seldom-Seen Species but for the most part Tropes Are Tools and so is making a character look less like their real world species counterpart due to The Law of Conservation of Detail, being able to tell a story easier (as Most Writers Are Human) and sometimes simply because it looks cool and/or fun. Viewer Species Confusion is a subtrope based on the audience reaction to a creature and I Am Not Weasel for in-universe reactions. This is related to the Cartoon Creature (whose actual species is entirely ambiguous), and Call a Smeerp a "Rabbit" (which is about the name of their species, and not the species itself). Many older examples of Seldom-Seen Species look and act very little (or nothing) like their Real Life equivalents. The tanukis in Animal Land look less like real life tanukis and more like small humans in bear-like costumes. One episode of Bumpety Boo involved a Killer Gorilla, which looked little like a gorilla and resembled a Bigfoot instead. In NEEDLESS, Miu's "teddy bear" is actually a rabbit, except it looks like a teddy bear, not a rabbit. Even the characters are like "That's a RABBIT???" upon finding out. The titular Pikaia in Pikaia, rendered as a Pokemon-esque Ridiculously Cute Critter rather than the worm-like creature it actually is. Which is ultimately pointed out by the show itself. Plue from Rave Master is supposedly a dog. Despite not having any ears, having a drill as a nose, loves lollipop candies, can walk on two legs, deflating when exposed to hot water, and generally looking for all the world like a tiny snowman, Plue is a dog. Elie thought Plue is an insect instead. The cats from "Ali Baba and the Forty Thieves (1971)" don't really look like cats, they look more like little bears with whiskers that look like they might have been designed by Dr. Seuss. The manga and anime Gokicha: Cockroach Girls, the titular character and her friend doesn't look like cockroaches at all and the look like very cute human girls with very long hair and two ahoges as antennae. Even more egregious that normal looking cockroaches appear along her. Pakdam Pakdai features a bulldog named Rox who looks less like a bulldog and more like a Great Dane. Cerebus, in the very early issues, looked reasonably like a bipedal aardvark, but as the comic progressed and Dave Sim's art improved, Cerebus looked less and less like an aardvark and more like a gray pig-creature. Alliusiz, a mnor character, is supposely a possum, but he looks more like a monkey. Invoked with the titular heroine: According with Word of God, Erma and her family are not based on any Feline breed or sub-species, albeit some fans pointed out they look like between the Manx cat , a breed from the Isle of Man in the U.K., the Abyssinian cat and the Japanese bobtail cat . Guess which species these ◊ two ◊ characters from German comic Fix & Foxi are supposed to be. The first one's a wolf - his name "Lupo" should be a hint - and the second one a raven, but honestly, could you have told? 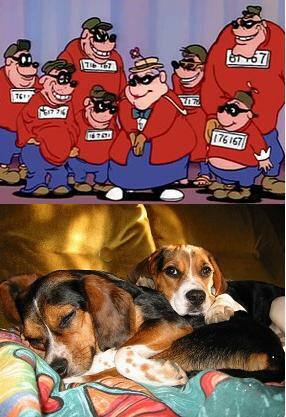 As noted by the page image, the Beagle Boys, who despite being more canine than the other Dog Faces (Especially in Mickey, Donald, Goofy: The Three Musketeers and DuckTales (2017)), still don't look enough like beagles. In a minor case, while Donald Duck's cousin Gladstone Gander is a goose there's basically no difference between him and the ducks. Launchpad McQuack looks more like a pelican than a duck. Archie Comics' Sonic the Hedgehog: Mina is a mongoose who looks more like a bear. The picture of Undertow, the Pristichampsus in Nathanoraptor's Ice Age 5 fanfic, on the author's deviantART page, reveals he looks more like a featherless Velociraptor than a Pristichampsus, or even anything vaguely crocodilian. Narf the Mouse from Zany To The Max. He only looks somewhat like a mouse. In fact, he doesn't look at all like a mouse except for his ears, tail, and buck teeth! He doesn't even have visible arms! Many animals in the various Dr. Seuss books. The eponymous Arthur of the picture books and later animated TV series is billed as an aardvark. In the earliest books there is some trace of a resemblance, and the elongated nose is actually relevant to the plot (though it resembles that of an anteater's more than an aardvark's.) Later in the series, you wouldn't know unless you were told. Lowly from Richard Scarry's works is supposed to be a worm, but he looks more like a snake. The illustrations of Roo in the original Winnie-the-Pooh books look more like a cat than a joey. Averted with Disney's Roo. This is a major plot point in A Dog's Way Home. Bella is a nondescript mutt but is repeatedly referred to as most likely being a mastiff or Rottweiler mix. A man at the local shelter, however, believes her to be a pit bull. Though various characters (including his co-workers) try to argue against this, it still causes trouble for Bella because her county has strict BSL laws. Bella is almost euthanized several times because she's erroneously dubbed a pit bull. As a result, Bella's owner sends her into foster care out of town until he can move out. Bella doesn't understand this and believes Lucas abandoned her. The day before he's set to come back for Bella, she runs away trying to get to him herself. In Power Rangers, Animal Mecha often don't look much like the animal they're supposed to be. However, sometimes, the zord's name was changed from Super Sentai, where it resembles the animal it was originally named for (Power Rangers RPM especially, where a lot of the less badass animal motifs in Engine Sentai Go-onger were renamed but you can't do anything about the sentai Stock Footage). Cat from Red Dwarf is a highly humanoid creature with absolutely no visual clues as to his real species. However, Cat is actually stated to be a creature evolved from the spectacularly inbred descendants of Lister's pet cat. Binyah Binyah Polliwog from Gullah Gullah Island looks more like an adult frog that still has yet to lose its tail than a polliwog. Many sources claim Dooly is a Ceratosaurus. While he is vaguely a bipedal dinosaur with horn on his nose, his resemblance to a ceratosaur is zilch. Ddochi is supposed to be an ostrich, but she looks more like some kind of white humanoid with bird-feet and a feather tail. One episode of the 2008 series had an orangutan which looked more like a gorilla with an orange mane. Lampshaded in Bloom County that eventually Opus looked more like a puffin than a penguin. Garfield looked reasonably enough like a chubby cat in the earlier comics. His more recent incarnations appear to look less obstinately feline, but he still looks somewhat reasonably like a feline. Also, Odie, who Jim Davis declared to be a beagle but is even less similar to it than Snoopy (in the live-action movies he's a dachshund; in this strip ◊, Garfield declares he's a "purebred clown"). Krazy Kat is not readily identifiable as a cat. (S)he looks somewhat like Yakko, Wakko, and Dot from Animaniacs, but with a flesh-colored face and pink nose. Mooch the cat from Mutts is not readily identifiable as a cat and looks rather like ◊ Yakko Warner ◊ from Animaniacs, except with smaller, more pointed ears, a bigger nose, and without the cheek tufts and tan colored pants. The resemblance would be even more noticeable if Mooch were drawn in the same style Yakko is drawn, or if Yakko were drawn in the same style Mooch is drawn. More of an informed breed, but Snoopy and his brothers look nothing like real beagles. Notably Snoopy wasn't originally intended to be a beagle, and even denied being one in an early strip. Woodstock doesnt even seem to resemble a bird, with his beak looking more like a big human nose due to the simplistic art style. Winslow from Prickly City is supposed to be a coyote pup, but he looks more like a cross between a bobcat and a Cairn Terrier. Pogo from Pogo looks nothing like a possum; he looks more like a monkey. In Mother Goose and Grimm, while Grimm is clearly a dog, he doesn't really share much of resemblance with Bull Terriers, which he's stated to be. Combined with Art Evolution, in the earlier strips he actually did look a lot like the particular breed. The University of Minnesota's mascot, Goldy Gopher doesn't look much like a gopher. Upon consultation the conclusion was he looks more like a chipmunk. 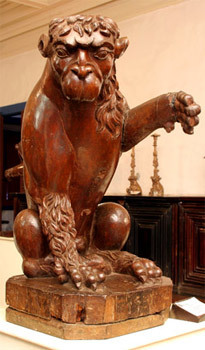 Given that seeing a lion in 18th century Brazil was difficult, the ones made by local sculptor Aleijadinho looked like monkeys ◊ - most notably in his statue of Daniel ◊ in a series with The Bible's prophets (which also includes another example, the whale carved on Jonah's statue ◊). Sea monkeys are a good example. The cartoons on the packages look nothing like the brine shrimp they are in real life. They are not monkeys either. This is probably an intentional attempt to fool gullible kids into buying them - a kingdom of merpeople in your aquarium sounds cooler than a bunch of brine shrimp. Because only the ivory made its way to Europe for a long time, walruses were initially depicted as elephants , and later as pig-fish hybrids. In a real life example, it's a known issue that many dogs in animal shelters are mislabeled. They don't give them DNA checks, so the people just check if they have enough characteristics of a certain type of dog and categorize them as such. Due to how dogs work, mixed breeds can look a variety of ways despite their heritage. This means that just about any dog could be called a "Lab mix" or "Pit Bull/Staffie mix" even if they contain very little or none of those breeds in them, and often times they don't truly resemble the breeds much either. The Tottenham Hotspur logo doesnt look much like a cockerel (rooster), looking more like a pigeon the logo of the Collingwood Magpies. K.C. Penguin from the Kid Cuisine commercials doesnt look much like a penguin, rather looking like a cousin of Daffy Duck. Earl Sinclair is said to be a Megalosaurus, but looks nothing like the actual dinosaur. Likewise, his wife Fran is supposed to be an Allosaurus. Allosaurus never had that Dilophosaurus-like crest on its head. B. P. Richfield is meant to be a Triceratops, but has the spiky frill of a Styracosaurus. Snook is supposed to be a modern-day tree sloth, but he looks more like a prehistoric ground sloth instead. Bob is supposed to be a Tamandua, a type of anteater, but looks more like a cross between Gonzo and a cat. Fozzie Bear is hardly identifiable as a real bear; he has more of a toy teddy bear or even koala look to him while other Muppet bears like Bobo look like actual bears. Pepe — if he didn't tell you he was a king prawn would you have any idea what he was? He's clearly some kind of crustacean, so...they got us to "within a subphylum", anyway. Beauregard, who was based on Wendell Porcupine from Emmet Otter's Jug-Band Christmas , by the time he appears in the movies and the TV series, doesn't look too much like a porcupine, with the rats convincing him that he was an honorary rat in the TV show (even though he doesn't resemble one). Sam the Eagle, while clearly a bird, doesn't really look much like an American Bald Eagle as he has none of the standard markings and is blue. Gonzo, whose species has been the subject of much guesswork due to his hooked nose/beak, started out evolving from Snarl Frackle in "The Great Santa Claus Caper". Kermit once mused that "he looked a little like a turkey, but not much" in The Muppet Movie. In The Great Muppet Caper, he's put in a crate with "whatever" marked on the side. In Muppets from Space, he is revealed to be an alien from a far away planet, and his alien relatives come to invite him back to his homeworld, and when he sees how he would be missing the other Muppets whom he considers his close friends and family, the aliens respect his choice to stay on Earth. An animated music video about animal families featured featured a chickadee as one of the featured animals, but the chickadee looked more like an Baltimore oriole (a bright orange bird) than an actual chickadee (actual chickadees have gray bodies, black heads, and white cheeks). Rosita was meant to be a fruit bat but she looks more like a blue Elmo or a mutated flying squirrel than a bat. After 13 years they removed her wing flaps and retconned her into being a Monster. The in-series reason for this is that she 'lost' her wings while flying through a cave. Big Bird looked much more like an actual bird in the beginning - and even then, he never looked as avian as his sidekick Little Bird. Many animals in Transformers are informed species. Birds in general often fall victim to this, as do most cats. The toys of feline characters tend to fall into a very similar (but not actually resembling any actual cat) build. In BIONICLE's 2007 line, the Barraki have launchers used to fire squids that look more like lampreys than actual squids and are also stated to be vampiric like the latter. G2 bombed in most places, bar a few European countries, because of this. The toys no longer resembled ponies, they looked like ordinary horses. While there is a lot of overlap between the two due to being the same species, ponies are overall shorter and stockier than other horses. G1 had "Dream Beauties" which were essentially a predecessor to G2. They didn't look like ponies, with the official consensus seeming to be that they were "teenage ponies". That didn't make much sense though, since most previous ponies were adults and ponies don't suddenly become long-legged during adolescence. G3.5 ponies just look off. They don't really resemble anything, besides maybe some sort of dog-horse mix. Their proportions are completely wrong even for Super-Deformed ponies. Just like the cartoon, G4 ponies less resemble horses and more resemble weird looking dogs. Celestia and Luna resemble horses, though they're supposed to be tall ponies. Carson the Muskrat in Dork Tower. He looks more like Snoopy than like an actual muskrat. This is lampshaded in one strip where he goes as himself to a costume event and gets told "Worst muskrat costume ever!" In Narbonic, none of Helen's gerbils look anything like real gerbils. Whether they look like in-universe gerbils that are not the creations of a Mad Scientist varies between strips. Layla Flaafy from Sonichu looks absolutely nothing like the Pokémon Flaafy except possibly for her curly hair, instead just being a sort of generic furry. Word of God (well, word of troll) says that she was created by one of the author's internet girlfriends and it was his idea to make her a Flaafy despite not changing her design at all. Chiro in The Fuzzy Princess is a bat, but she looks more like a flying cat. In El Goonish Shive, Adrian Raven initially doubts Grace is part-squirrel because her part-squirrel form has a very humanoid face with non-squirrel-like teeth. He is convinced when he sees her full-squirrel form though. DSBT InsaniT: Frog barely looks anything like a frog. He looks more like a gumdrop with webbed limbs. Parodied in ASDF Movie, where some kind of sauropod calls itself a Stegosaurus. Sherlock from Homestar Runner is said to be a mix between a cow and a helicopter, but he looks more like a jellyfish type thing. The wolfiin of Wings are meant to be wolves, yet they look more like dogs or cats depending on the shot.